Dorje Ling is a not-for-profit Dharma (“teaching”) Centre in the Tibetan Buddhist tradition. Visitors are welcome to drop by to meditate, browse our library, view our collection of Tibetan and Asian art, or simply enjoy the serene setting and magnificent views. You do not have to be a follower of Buddhism or any other faith to visit or participate. Most programs are by donation. We hold an informal “sit and tea” every Sunday at 2pm. By donation. All are welcome. 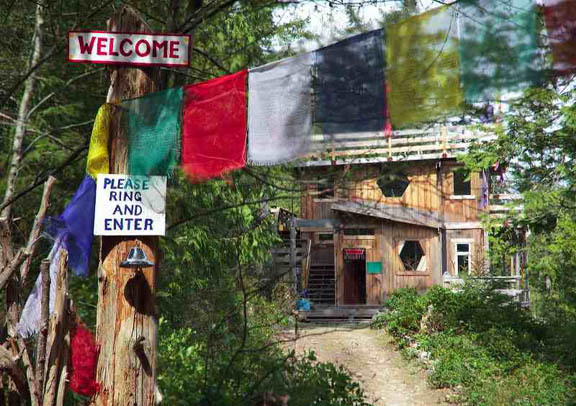 The Babbling Buddha Meditation Hostel offers a limited number of rustic accommodations and campsites, for a maximum stay of seven days. Reservations are advised. Dorje Ling is open to hosting any events, classes or workshops that are based in compassion. Please contact us to inquire.